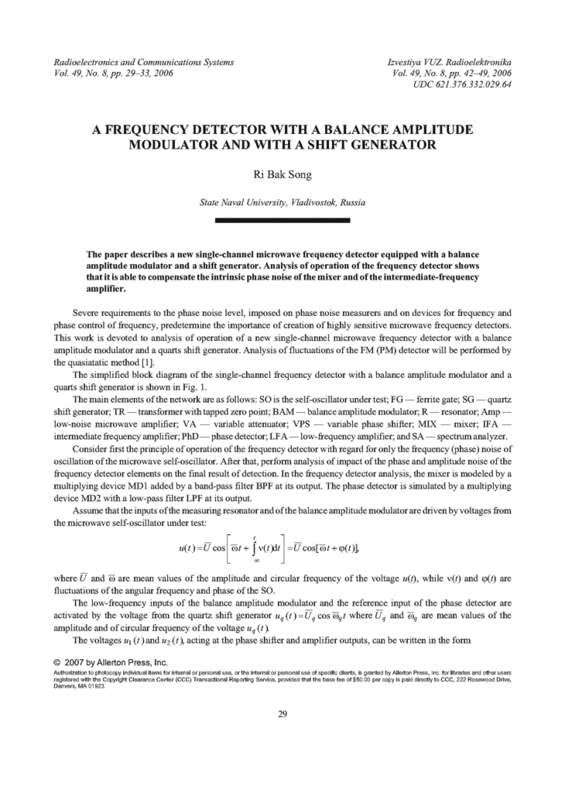 The paper describes a new single-channel microwave frequency detector equipped with a balance amplitude modulator and a shift generator. Analysis of operation of the frequency detector shows that it is able to compensate the intrinsic phase noise of the mixer and of the intermediate-frequency amplifier. LEVIN, B.R. Theoretical Foundations of Statistical Radio-Engineering [in Russian], Book 1. Moscow: Sov. Radio, 1966. APTEK, Y.E. ; GORELOV, A.I. "K voprosu ob izmerenii shumov SVCh generatorov," Voprosy Radioelektroniki, Ser. Izmeritel’naya Tekhnika, n.1, 1965.